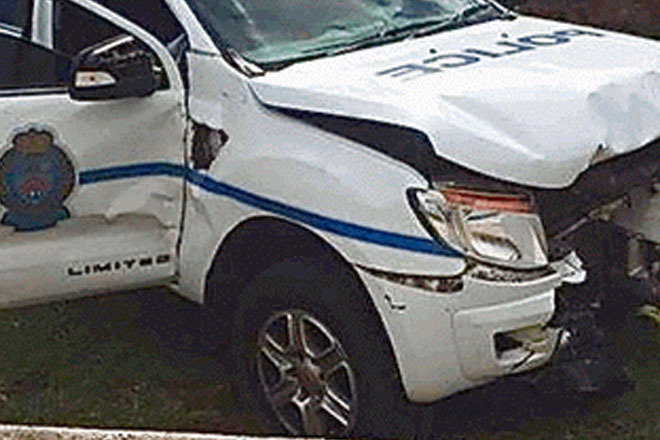 (ZIZ) — The police on Nevis are investigating a traffic accident on Thursday involving an officer driving a police vehicle in the Indian Castle area on Nevis. According to reports, a police patrol responded to a call of a suspicious vehicle in the Rawlins village area at around 11:30 pm. Upon arrival, the officers conducted an investigation around the area and noticed that one person was occupying the vehicle. The officers spoke to the man who they later offered a lift home. According to reports, the individual was safely transported to his residence. Reports also indicate that after leaving the residence, the officers heard a noise on the roof and saw the man who they thought was at his residence, attempting to enter the police vehicle. The police say the individual struck the driving officer in the face and pulled at the steering wheel while on the roof. The officer then lost control of the vehicle and collided with a parked excavator. Both officers were taken to the Alexandra hospital for treatment. It is unclear what happened to the man as reports indicate that he left the scene but returned to the Police Station the next day and filed a report of robbery saying the officers robbed him. ZIZ reached out to police in the Nevis Division but they declined to comment.